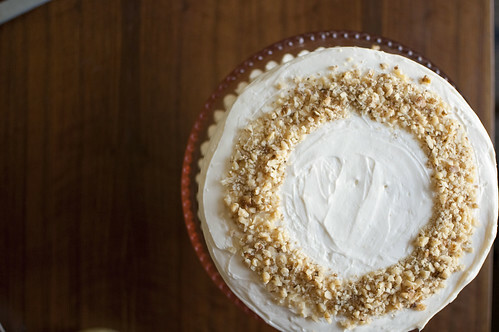 My current favorite carrot cake recipe (from Smitten Kitchen). No need to modify anything - it's perfect as it stands. As Deb suggests, do use the box grater rather than the food processor to do the carrots, even if it is tedious. I've made these as cupcakes and they were wonderful but I had quite a bit of batter left over. They will rise, so don't overfill the cups (like I did). This time around I wanted a cake and the recipe perfectly filled two 9 inch rounds. I topped it with crushed walnuts, the national sign for carrot cake. You can free hand the circle, of course. But that always makes me nervous, so I take a rather more obsessive route. 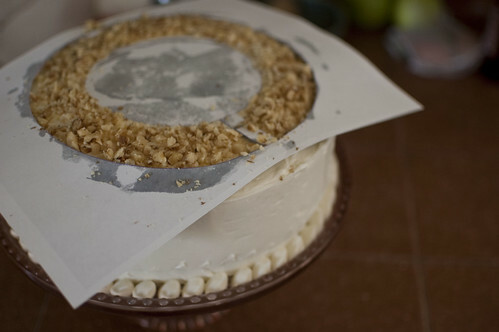 Cut out a stencil, lay it lightly on your (refrigerated*) frosted cake, top with walnuts. Remove the stencil gently and fill in the two little bars by hand. It's like cake decorating for pre-schoolers! P.S. I get that sort of rustic frosting finish by using an offset spatula . A million times easier than trying to use a regular knife, truly. * If the frosting is chilled, then your stencil is less likely to stick to it and cause a mess. Of course, the walnuts are also less likely to adhere, but you can press them down gently with your fingers after you take off the stencil. What a beautiful cake Rachel! Now I can't wait to make one. I'm kind of always on the lookout for a better carrot cake recipe...which I'm sure makes my life sound totally interesting. 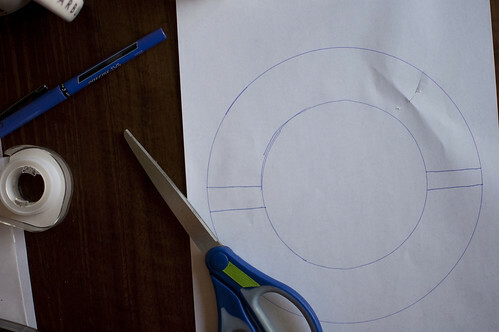 :) Thanks for sharing and for the clever circle walnut idea! carrot cake is my absolute favorite (well, after chocolate, but i figure that's a given). thanks for the great recipe! this looks amazing. I would love a bite :) beautiful cake Rachel !! yum. i am definitely trying this for thanksgiving dinner. um, STUNNING. and delicious looking. win win. This cake looks INSANELY delicious! I want some! Also, beautiful shots! This was our wedding cake! A friend offered to fancy it up for us. It was so delicious, there was none left at the end of the night. This cake looks AMAZING. And I love carrot cake!! I love your stencil idea. This cake looks gorgeous and delicious! Using a stencil is a fantastic idea, so clever. I haven't had carrot cake in far too long! I love SK! Looks fantastic!! I love the stencil idea! Now I am totally making a carrot cake for a party on Sunday. I also love the pink cake stand. Very pretty! Thanks for sharing. ok the stencils just put that cake over the top adorable! oh, nothing beats carrot cake. yours looks lovely. I love this idea with the stencil, such a pretty cake! 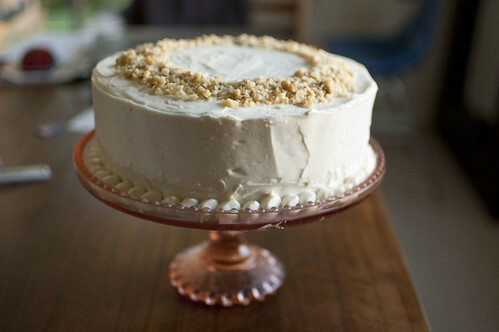 Carrot cake is one of my favorites, I will have to check out the Smitten Kitchen recipe. I know I've made this before and I must have a half dozen cakes on my 'to-bake' list, but now all I can think about is carrot cake! Yum!